Having used the Xperia X Compact for several weeks, I have to say it is a great phone. Its performance is solid and its compact design makes it easy to carry around – yet it isn’t so small that you feel like you are holding a child’s toy. The camera in the phone is stellar with outstanding quality that really makes this phone compete with really any phone out there from a photos perspective. The battery life is good for most users and Sony has indicated that this phone will see Android Nougat sometime after the first of the year. All-in-all, I can recommend this phone for those of you who are looking for a compact but powerful Android phone. We live in a world with big display phones and in Androidland, that is most certainly the case. It is hard to find device under 5″ that have any sort of horsepower or performance. The problem is, not everyone wants a 5.5″ device or even a 5.2″ device and that means you are meant making compromises in either screen size (going larger than you want) or performance. 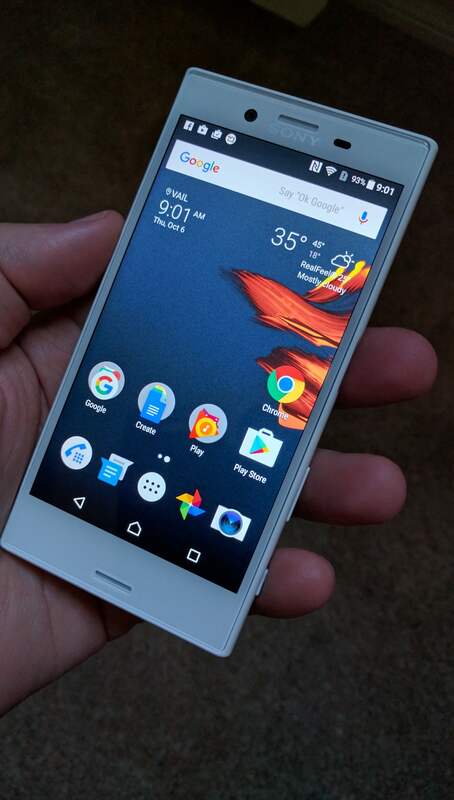 I’ve been using the Sony Xperia X Compact over the course of the last few weeks and it is the one phone in the sub-5″ screen size market that doesn’t require that compromise. It offers solid performance, good battery life and a camera that is truly impressive. As I posted in my initial thoughts on the Xperia X Compact, it is a phone that should not be judged on it size when it comes to performance. This phone has plenty of horsepower to do anything you need, including gaming and streaming, but does it in a small and comfortable package. While the $499 price tag may put some off, if you are in the market for a smaller phone that doesn’t have a lot of compromises, the Xperia X Compact should be on your short list. specs just because you want a smaller device. This phone is not inexpensive and it has the internals of a solid performing smartphone. It is powered by the Snapdragon 650 hexa-core processor. It has four 1.4 GHz Cortex-A53 cores & two 1.8 GHz Cortex-A72 cores. The processor is coupled with the Adreno 510 GPU which provides good graphics performance. The X Compact has 3GB of RAM onboard and has 32GB of built-in storage. That storage can be expanded up to an additional 256GB thanks to the Micro SD slot that is built into the SIM tray of the phone. With the smaller screen size, as you would expect, the X Compact is a pretty small device. It measures 129 x 65 x 9.5 mm or 5.08 x 2.56 x 0.37″ in old money. Weight wise it is 136g or 4.76 ounces. I’ll cover the form factor in more detail in the form factor section but the phone is comfortable to hold and very easy to slip into any pocket. The camera array of the Xperia X Compact is impressive. The main camera is a 23MP f/2.0 24mm shooter with phase detection auto focus and a LED flash. It is capable of shooting 1080p HD video at either 30 or 60 frames-per-second. The front facing selfie camera is 5MP at it too is able to shoot 1080p video. I’ll discuss the cameras more in the camera performance section of this review but it is sufficient to say it may well be the killer feature of this phone. The phone does have a fingerprint scanner built into the power button for easy unlocking and authentication. However, for some bizarre reason, Sony disabled this on the US model of the phone. This makes, frankly, zero sense to me especially in light of the fact that the scanner is enabled on the UK version of the phone. Indeed some X Compact (and X5) owners have taken to flashing the UK ROM onto their US phone just to enable this feature. While that technically voids the warranty and I cannot suggest you do it, it speaks to the increasing importance and expectation of a fingerprint scanner on a 2016 phone. Battery wise, the X Compact has a 2700mAh battery which, given the size of this phone, is pretty big. For comparison, the iPhone 7 only has a 1980mAh battery. I’ll talk more about the battery performance later in the review but generally speaking it will get you through an entire day. The Xperia X Compact is quite comfortable to hold thanks to its smaller size. The front of the phone is dominated by the 4.5″ display and it has roughly a 70% screen-to-body ratio. The right edge of the device is where you will find the power button, volume rocker and a dedicated camera shutter button. The left side is only interrupted by the SIM and MicroSD tray. On the back you will find the main camera and flash while on top you will fnd the headphone jack. The edges of the phone are slightly rounded which makes it easy to hold but at the same time, doesn’t jab your hands if you hold it tighly. Equally, the phone’s size makes it quite easy to put this phone into a hip, front or shirt pocket without sticking out of your pocket. In truth, because I’m a tall guy with big hands, I’ve always preferred larger screen devices. They are easier for me to hold and I don’t feel like I have a toy in my hand nor like I’m going to fumble the phone. I have been pleasantly suprised while using the X Compact. It is very comfortable to hold but it has enough weight and proper dimensions to make it feel securely in your hand. Launchers in the Android ecosystem tend to be a personal experience so the likeability of a launcher tends to be a just that: Personal. The Xperia Launcher overall is pretty good. It has some quirks and frankly, because it uses the KitKat style home buttons, it looks more dated than it should. But from a functionality perspective, it works and it works well. Sony has built some very nice clock widgets into the Launcher as well as a nice weather panel which you can make completely transparent on your Home screen. Functionally, it works as you would expect for a launcher so there isn’t really much to distract you or cause frustration using it. If you are new to Android or just want to get going with the Xperia X Compact, the the Xperia launcher will be more than enough to do the job. If you want some deep level customization, maybe another launcher will do the job for you. The bottom line is don’t let the launcher be a distraction from the overall goodness that is this point. That’s a changeable app. But even if you aren’t interested in a new launcher, this one will meet most users needs. While the X Compact does not have the most advanced chipset out there, it does perform very well in every day use. It had no problem keeping up with tasks like Gmail, YouTube, Calendar and other productivity apps. It does lag a bit when it comes to intense games, like Real Racing 3 (my defacto testing game for phones). It struggled to keep up but frankly, a game like that on a device this small isn’t going to be a lot of fun anyway. If you are looking for a serious gaming phone, look elsewhere as this one isn’t going to be up to the task on graphically intense games. The Geekbench results for the phone somewhat tell the tale. It is firmly in the middle of the pack of most 2015/2016 devices on the multi-core test but lags in the single-core test. What the Xperia X Compact lacks in horsepower it makes up for in the cameras. In spades. Both the main camera and the selfie camera are excellent in quality and in color accuracy. Sony, as you would expect, has done an exceptional job with the cameras on many of the Xperia devices and the X Compact is no exception. I took a wide range of photos with the phone both inside and out and found that it did very well in almost any condition. It did struggle a bit with snow – turning everything a bit too blue – but that is the norm for most digital cameras. Video wise, you won’t be disappointed either. The main camera can shoot in 4K and quality and clarity is outstanding. Here is a link to my YouTube channel of a video shot of a waterfall to give you a good example of the quality. Below is a gallery of photos taken with the X Compact. This will give you an overall flavor for how it performs. Much like their cameras, Sony has been known for doing a great job on their audio out of their phones. The Xperia X Compact continues this tradition. With dual front speakers, the audio quality is excellent from the phone with good bass tones and treble. While it isn’t going to be as good as an external speaker, while on the go or in a room by yourself, you won’t be disappointed. Because of the physical size of the X Compact, the battery in it is, understandably, smaller. It is rated at 2700 mAh which, considering the size of the phone, is pretty good. With normal daily use I had no problem making it almost all the way through a day without charging. That consisted mostly of emails, a bit of web surfing, streaming music from Google Play Music and a few videos from YouTube. If you are a power audio or video viewer, you likely will struggle with getting through a day so keep that in mind. For most users though it is up to the task. I put this section in this review simply to poke fun at Sony. The Xperia X Compact in Europe has the fingerprint scanner enabled, which is embedded into the power button like the Nextbit Robin. Here in the US, for whatever reason, Sony did not enable this feature. In fact, some owners of the phone here in the US have flashed the UK ROM to the device just to enable the feature. That, of course, voids the warranty. But the bigger issue is why on earth Sony didn’t enable this feature. It makes no sense in this day to not have a feature enabled on a phone, especially one as important as a fingerprint scanner. Hopefully Sony will get this enabled quickly through a software update here in the US. The Sony Xperia X Compact is available from a wide range of retailers online. Amazon has it available for $399 in Black, Blue or White.